Cleaners, catering staff, porters and security staff were among Bolton NHS workers who started a 48-hour strike for fair pay this morning, staffing picket lines from 7am, with the promise of more action to follow if their pay issue isn’t resolved. The UNISON members’ strike has been provoked by their employers’ refusal to pay nationally agreed pay rates for NHS staff to staff employed by a subsidiary company that the trust set up and owns. This is even though the company – iFM Bolton – said last year that it would pay agreed NHS rate for the job under Agenda for Change terms. Staff in other hospitals doing the same jobs are already getting the agreed higher rates of pay. iFM Bolton management has recently offered to pay staff the living wage – which is calculated by the Living Wage Foundation and is currently set at £8.75 an hour, but with a new rate due to be announced on 5 November. This is still less than the lowest NHS pay rate which is now £8.93 per hour. The gap is anticipated to grow in future years, reaching up £1,500 a year in 2020/21, assuming future living wage increases are in line with the average of 26p an hour for each year since 2011. “I’ve never had to go on strike before, but we’re all standing together and I’m not scared. “We’re so upset with management. They seem to think that we’re worth less than domestics in all the other hospitals, but we do a lot to keep the hospital clean and running smoothly. If the issue is not resolved, UNISON has informed the company that a second three-day strike will take place on 23-25 October. “This is a very simple matter of fairness,” says UNISON north west regional manager Kevin Lucas. “iFM Bolton managers made a promise to their staff that they would pay the NHS rates. They just need to fulfil that promise. “Hospital staff are committed to the services they provide and the public that they serve, but they feel they have no option but to take strike action in these circumstances. “They are not asking for much – just that their employer does what they said they’d do and pays the going rate for the job. It’s outrageous that health bosses in Bolton are trying to cut back on the wages of the lowest-paid staff in the NHS. The strikers will hold a rally in Bolton town centre at noon tomorrow, 12 October. 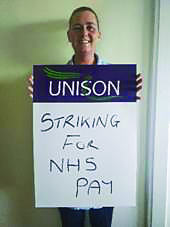 The article Bolton hospital staff strike today and tomorrow for NHS pay first appeared on the UNISON National site.